A common characteristic of a Hillary Clinton campaign is to distort the views of her opponent and lie about the facts as opposed to engaging in an honest exchange of ideas. We saw this when she ran against Barack Obama eight years ago, and have repeatedly seen this in the past several months. She appears to have stepped up her smear campaign now that she is losing her lead in the polls. Democracy For America has also issued a response to what they refer to as Clinton’s “bald-faced lies” on Sanders’s gun record and “right-wing attacks” on healthcare. Their response can be found here. This attack, similar to the attacks from Hillary Clinton during the last Democratic Debate, greatly distorts Sanders’ proposal for Medicare For All. Rather than dismantle Medicare, Sanders proposes providing Medicare for everyone as it provides better coverage at a lower cost than any other system we currently have. It would further expand the number of people covered, and not take away health coverage from millions. Hillary Clinton took aim at Bernie Sanders’ single-payer health care plan on Monday, characterizing it as “turning over your and my health insurance to governors,” specifically naming Republican Terry Branstad. It’s a pretty clear reference to the many conservative states that have refused ObamaCare’s Medicaid expansion — implying that Sanders would allow conservative states to opt out of his plan, and hence partially destroy all federal health insurance programs. Hillary Clinton once said it “undermined core Democratic values” and gives “aid and comfort” to the special interests and “their allies in the Republican Party” for Democrats to attack each other’s health care plans. Today, in another flip-flop, she’s doing exactly what she once decried. In the wake of new polls showing that Sen. Bernie Sanders’ campaign is gaining ground or leading in the Iowa caucuses, Clinton’s campaign has stepped up attacks on Sanders and his health care proposal. The most recent volley is an attack on Sanders’ plan to create a Medicare-for-all health care system for all Americans. Clinton’s attacks on a Democratic Party rival over universal health care marks a very public flip flop by her and her campaign. 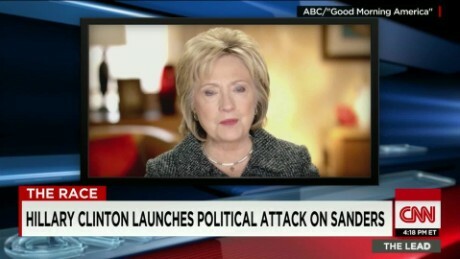 She is now using the same Karl Rove tactics she once decried in this video. Clinton is also repeating her dishonest attacks on Bernie Sander’s record on guns. She is basing this on votes from several years ago, ignoring the fact that bills have a lot of components and Sanders’ votes based upon some aspects of a bill does not indicate an opposition to gun control. Clinton has also been far to the right of her current position on gun control in the past, such as when she debated Barack Obama in 2008. Clinton has taken multiple positions on gun control over the years, campaigning even further to the right at times in 2008 when she described herself as a “pro-gun churchgoer.” Despite her major flip-flops on guns, Clinton also sent out a dishonest flier attacking Obama on guns, just one way she is repeating the same dishonest tactics employed in her unsuccessful 2008 campaign. “…regardless of who wins our nomination, the goal of Democrats holding on to the White House in 2016 is being made more difficult every second the Clinton campaign continues to distort the facts on Bernie Sanders’s strong record against gun violence and attack a core progressive idea like universal healthcare. Update: Clinton’s lead down to two points in Des Moines Register poll (withing margin of error). Posted in Barack Obama, Bernie Sanders, Health Care, Hillary Clinton, Politics. Tags: Bernie Sanders, Democrats, Gun Control, Health Care Policy, Health Care Reform, Hillary Clinton, Politics. RSS feed for comments on this post.. TrackBack URL. Senator Bernie Sanders has all the qualities and abilities of a true leader. Bernie is kind, fair, honest, humble, authentic, energetic, intelligent, experienced, and passionate about helping all children succeed in this nation, thus building a stronger and brighter USA for future generations. Check out Bernie's record on you tube. He was recently given the top congressional award from the Veterans of Foreign Wars. Bernie is dedicated to ending the "legal bribes and money making schemes" going on in government today. Democratic (by the people) socialist (for the people) means building social programs that build this country such as public schools, library, post office, military, social security..all programs that have benefited Americans. Vote smart! Vote for your child a role model. Vote for a true leader, Bernie Sanders for president 2016! We may never have another chance to save our democracy! The term is "bold-faced lies" such as bold font not "bald." Other than that, I don't trust HRC. Have never voted for her, will never vote for her. Bernie Sanders is the only choice for the good of our country. In this case I was quoting another article so I quoted as they used it.